The 'Standard' reference for all Canadian coins! 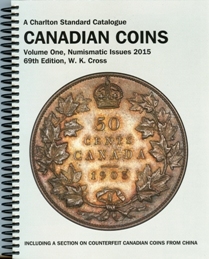 "First published in 1952 the Charlton Standard Catalogue of Canadian Coins reports on all aspects of the Canadian numismatic scene, from the coinage of the French Regime to the business strikes of today. Two new variety listings have been added to the 69th edition, the Doubled Die 1967 cent, and a Near and Far 2 variety for the 1932 five cents. The back section of the book has been converted to a Chinese counterfeit detection chapter on the Canadian 25 and 50 cents counterfeit coins from China. A plague for the collector." This is the most comprehensive guide to Canadian coins!